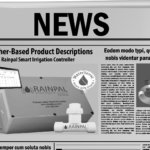 MC Smart Controls and Rainpal Technologies Partner to Create a Revolutionary Leak Detection and Freeze Protection Technology for the Home and Smart Irrigation Systems. Park City, UT April 19, 2012– Domestic sprinkler irrigation is among the largest consumers of water in the United States. Most systems just turn on their sprinklers on a clocked-schedule. Whatever amount flows is applied even if it is raining or if the ground is already waterlogged. A system smart-enough to consider the weather conditions and the needs of the plants has the potential to significantly reduce costs and consumption while still keeping the plants green and healthy. The overview screen of the Park City internet based weather smart irrigation system. The system could be controlled in “Auto” mode using internet satellite and land based weather information. The system could also be controlled by the standard industry based “Time” mode in which the system ran on a time schedule. The last mode was the “Manual” mode in which the system could be manually turned on and off from the main computer or via the internet on a “Smart Device”. At the time, the only smart irrigation control system available that could be controlled over an APP. American Control Technologies, Ltd., a leading developer of wireless control system technologies for the water and waste water industry evolved and ventured into the irrigation business. ACT teamed up with a large local irrigation contractor, H20 Connect LLC, and developed one of the world’s first internet weather-based irrigation controller systems. Troy Packard, President of H20 Connect, LLC and a veteran of 30 years in the irrigation industry required a cost-effective means of saving water that he could supply to the irrigation industry. The system uses the standard FAO Penman-Monteith Evapotranspiration equation to estimate daily water loss. That equation calculates a standardized water-loss factor that can be multiplied by a vegetation-specific factor to find the water loss for the exact conditions of each sprinkler zone on each property. Analysis of the weather observations will be used by the weather information provider to perform the calculations for each hour. Once each evening the factors for the entire day they are picked off the Internet by the centralized computer. The other factor is the inches of actual rain (from any form of precipitation) that fell each day. Once each evening that number will be picked up and totalized by the central computer. Those totals, and other information of interest beyond the calculations such as freezing temperature warnings, are transmitted to each subscribing property for use on its display and in its calculations. The system ACT designed is an efficient central computerized server for weather information with wireless links to small on-site controllers that respond with an optimum schedule for sprinkling. 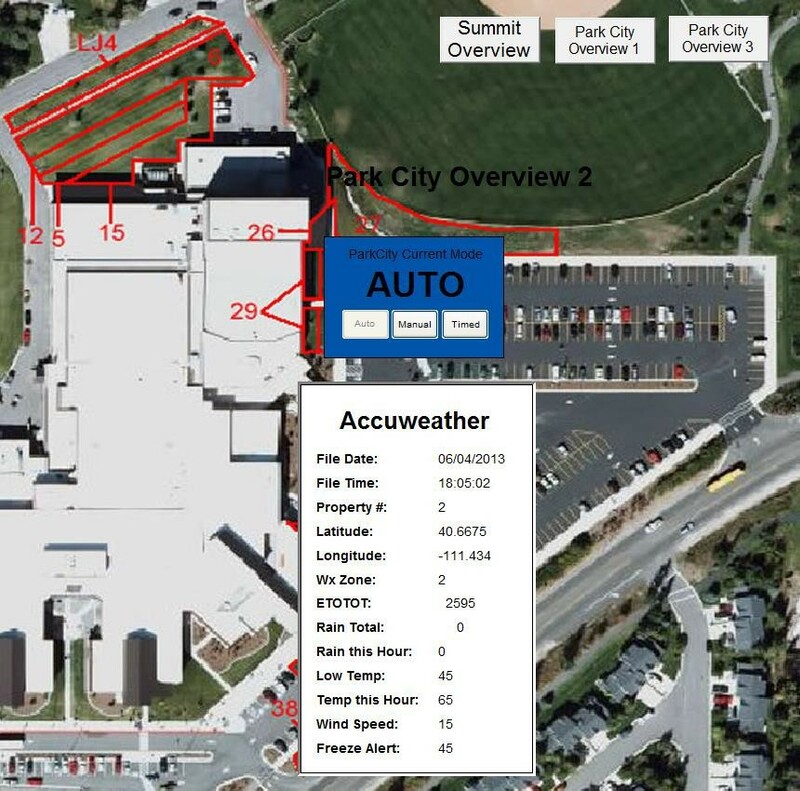 In April 2012 they installed systems in all of the Park City school facilities and a few local housing developments. The three Park City school facilities saved an average of 40-50 percent on their irrigation water billing over the first two summers after the systems was deployed. 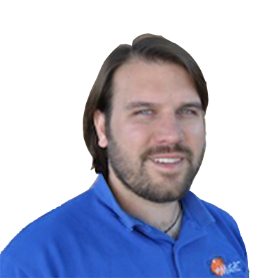 For the next three years, Lawrence Lebeau worked with several companies to develop a superior smart irrigation controller for the commercial, residential, and agricultural market. Smart Cloud Irrigation company was born and now has developed a superior smart irrigation technology, The Rainpal, that is capable providing the most advanced hardware and software algorithms to help the world save water while maintaining the best possible landscapes and crops. The product is also compatible with most of all the newest home automation systems and is currently working on its partnership with NEST. The RainPal is a smart irrigation controller designed and manufactured by RainPal, LLC of South Jordan, Utah. The controller receives high-resolution weather data specific to the property, and then calculates the effects of those weather factors on the unique combination of plants, soil, and sun exposure within each zone. The controller has earned EPA WaterSense certification – proof of its watering efficiency – with an unprecedented 100% Irrigation Adequacy and 98% Scheduling Efficiency scores. The Rainpal system is currently being deployed in North America, South America, and The Middle East including Dubai. Several large irrigation suppliers are private labeling our product around the globe. Shown here, The Rainpal controller with its smart device Application user interface. The device can be accessed for monitoring, control, or configuration over the internet, on the local network, or as a direct hot spot access point within 100 feet from the controller. The Rainpal device comes in three models. The Rainpal Pro residential unit, the Rainpal Commercial unit, and the Rainpal Agricultural unit. Over the last two years Mani Group LLC. 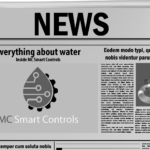 joint venture with a controls company in Chile, South America “MC Smart Controls” and they both tapped into their smart control industry background and created a technological breakthrough in the water saving industry. The technology is an inexpensive water saving product for the irrigation, home, and commercial markets. They have introduced the MC Smart Controls leak detection and freeze detection sensor. 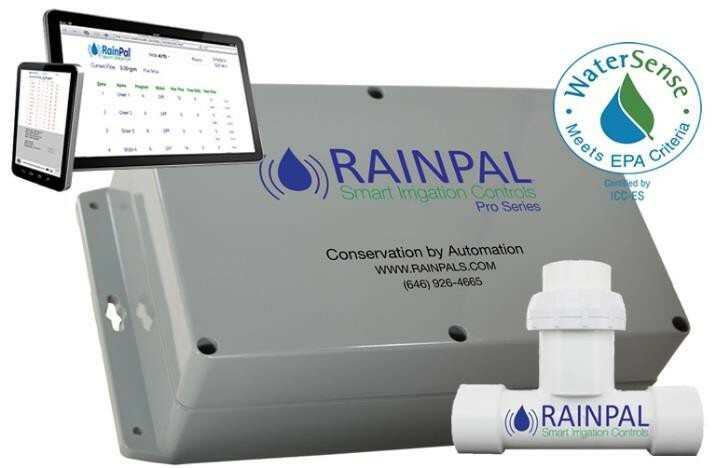 The irrigation version of the sensor can be installed directly into the water feed line of an irrigation system and interface into the Rainpal smart controller or the local WIFI network which allows it to interface into any other existing brand controller. The residential and commercial market version of the sensor, the “FL- 1000” can be installed on the main feed of a building before the shutoff valve and then can be setup on the local WIFI network. It can now be connected to other electric valves through IFTTT using any smart jack on the IFTTT platform . The FL-1000 user interface allows the user to test for leaks at any time. 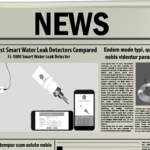 Enter emails to forward leak detection and freeze warning alarms. The user can enter a temperature set point value to trigger an alarm or warning when the water temperature reaches the set point. 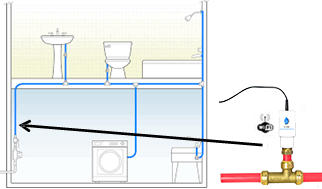 The FL-1000 freeze and leak protection sensor can be easily installed in the main water feed line of any residential or commercial property before the main shutoff valve. 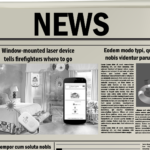 The device can be easily configured on to the local WIFI network with any smart device. The user interface allows the user to configure at what temperature the sensor alarm triggers to protect against freezing. In “Auto” leak detection mode, the user can configure the sensor to automatically detect leaks any time of the day. In “Manual” leak detection mode, it also allows the user to do a manual leak test on their property. The sensor will automatically send an email and or a text under an alarm condition to wherever it is designated to be sent. This device can be interfaced or integrated into any home automation or smart home system. Mani Group, LLC is a Utah based control engineering firm, which was founded two years ago by a group of partners who recognized a need for technologies that help the planet save and conserve water. MC Smart Controls, LLC Is a Utah based partner with MC Smart Controls SpA, a South American based company in Chile which was founded three years ago and is primarily focused on agricultural, industrial and environmental technologies. Lawrence brings over 36 years of experience in electronics and control process technologies, which started when he was a communications and electronics expert in the Special Forces of the United States Army. Since then, he has earned degrees in Electrical Engineering from the University of Maryland, Johnson and Wales, and a sales and marketing degree from Johnson and Wales and Harvard. Eric brings over 26 years of experience with extensive knowledge in process safety management, facility management and operations. Operating the refrigeration plant for the US Bobsled track and grounds at Utah Olympic Park in Park City, Utah. 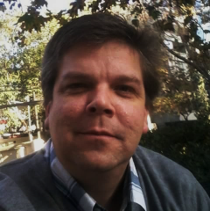 Eric relocated to Santiago, Chile in 2009 to live and learn the business culture in Latin America. Began a professional English language service company, TechTalk Chile and has now co-founded MC Smart Controls, developing intelligent solutions for community, commercial, municipal, mining and agricultural applications with IIOT platforms for MCSC automated control systems and smart automated management systems. Falling back on his experience in facility management, landscape and irrigation background, Eric has been a big part in the weather application for Rainpal and has participated in the user interface build on the climate control and server end for the intelligent weather service as well as involved with the development and design of the FL-1000, BR-1000, DF-100 and their user-friendly interfaces. Currently developing the IIOT platform for industrial preventative maintenance and process safety management systems. Cal brings over 20 years experience. Received his Ph.D., Electrical Engineering — Utah State University with extensive knowledge in electrical, unmanned, controls, sensors, and aerospace systems engineer. Has led and participated in research in aerospace research, scientific equipment design, autonomous systems development, and controls at many levels. Currently serves as faculty representative and lead systems engineer managing research and development of comprehensive unmanned aerial remote sensing project, Aggie Air. 4+ years experience in lab and project management with up to 25 interdisciplinary undergraduate, graduate, and full-time team members. 9+ years engineering experience in robotics and unmanned aerial remote sensing labs. 5+years engineering experience in aerospace research, including work on small satellites, rocket imaging, high-altitude balloon payloads, and unmanned Mars mission proposal. Cal is the leading programmer and developer for Rainpal, FL-1000, BR-1000, DF-100, and is currently revising the MC Smart Controls PCB to work more efficiently with today’s IIOT integrations. Josh brings over a decade of experience as a full stack web applications developer designing and building database-driven PHP applications and IoT ecosystems. In that time, He has also built and managed multiple linux-based servers to provide secure platforms for them. He has played a huge role in the development of the Rainpal irrigation system as well as developed the server for MC Smart Controls, Rainpal weather services, FL-1000, BR-1000, and DF-100 sensors for device management.